A marketing realignment or hiding from SunFab Solar customers? And thoughts about PV (Photovoltaic) conferences and expos. Applied Materials, Inc. (NASDAQ:AMAT) was missing from PHOTON‘s 6th Photovoltaic Technology Show 2010 Europe in a visible way. The stand space AMAT reserved for the Expo was empty, and as far as I could tell, Applied did not speak in any of the seven (7) co-located conferences including PHOTON’s 5th PV Production Equipment Conference Part 1 – c-Si or Part 2 – Thin Film. Every year Applied evaluates its attendance/participation at various tradeshows and conferences. So, our show schedule changes…we make choices every year. Those that are fixed on our schedule include Intercooler Europe, EU PVSEC, SNEC, and Solar Power International among others. The AMAT decision to withdraw from the PHOTON Show appears to have been made late since a placeholder page was printed in the expo guide. Competitor Oerlikon Solar, a business unit of OC Oerlikon Corporation AG (VTX:OERL), also skipped the Expo by apparent preplan but had multiple speakers at the Conferences. Volcanic ash was not the root cause for the AMAT decision. In fact, PHOTON had a few speakers present via video conference because of the air travel disruptions caused by the Eyjafjallajökull eruption and ash cloud. I understand from PHOTON that Applied Materials could also have leveraged the video conference medium to present. Last year, I heard mumblings about AMAT spending too much on marketing SunFab and not enough on research and development. Investors and SunFab customers might applaud the shift, but the timing reinforces the “Rumor mill: Layoffs seen at Applied” by Mark LaPedus at EE Times and the AMAT SunFab series over at Greentech Media. Meanwhile, Applied has been entertaining US politicians in Santa Clara per “U.S. SEN. CANTWELL AND U.S. REP. GARAMENDI VISIT APPLIED” while the establishment of the Advanced Solar Research and Customer Demonstration Facility in Xi’an, China, has US based AMAT SunFab employees concerned their jobs will be transferred to China whether they achieve 10% module efficiency by July 2010 or not. 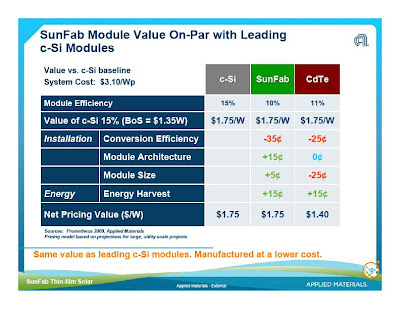 Greentech Media’s speculations regarding a SunFab exit are challenged by other PV industry sources who believe an AMAT SunFab exit would devastate Applied’s solar business segment across technologies. And many were shaking their heads at the above slide presented by Applied Materials Dr. Chris Eberspacher at PHOTON’s 2nd PV Thin Film Conference earlier this year in San Francisco. What about the PHOTON Expo? Will solar expos dig their own grave? Darren Brown’s final thought. With Photovoltaic Conferences and Exhibitions more abundant than Thin Film PV manufacturers, why hasn’t the trade press written about PV event consolidation? For many media companies, I would not include PHOTON in this set, conferences are a key driver for profitability. The feedback I heard from companies exhibiting at the PHOTON Expo was consistent; slow yet high quality traffic. The PHOTON Technology Show Europe was late compared to 2009 and the date fell close to the earnings season for public PV companies and the SNEC 4th (2010) International Photovoltaic Power Generation Conference & Exhibition is just one week later. The former kept analysts away, and with China the global crystalline silicon (c-Si) manufacturing center, most c-Si production equipment and service companies will prioritize Shanghai over Stuttgart. As an aside, the old PV guard such as Dr. Peter Woditsch (who stepped down as CEO of Deutsche Solar in July 2009), Dr. Winfried Hoffmann, and Dr. Hubert Aulich were also absent from the PHOTON Show and Silicon Conference. Was it retirement, gangbuster business, or the back room and off the record talk of a PHOTON boycott at work here? As the DEK Solar Blog observes, timing and location are everything for a successful photovoltaic conference and exposition these days. There are just plain too many being organized around the world. PV conferences, expos, or both need to obtain critical mass, differentiate, or die much like any company participating in the PV industry. Behind the PHOTON Europe Insolvency: Photovoltaic Meltdown?